There were long queue of viewers forParashurama ~ The Axe-wielding Rama, presented by Kalavedi at the Shriram Centre last week. A mythological dance-theatre production by Shashidharan Nair in collaboration with the Indian Revival Group, the presentation was based on the legend of Parasurama, the sixth incarnation, or Avatar, of Vishnu, the story of a boy, who was forced to take difficult decisions in order to fulfill his duties towards his parents and to the idea of a fair and just society. The impressive production was designed, directed and choreographed by Shashidharan Nair, a well-known and exceptionally-gifted dancer/choreographer, who has mastered Kathakali, Mayurbhanj Chhau and Kalaripayattu under legendary Gurus. Associated with Shriram Bharatiya Kala Kendra for over three decades, where he choreographed and participated in some of their critically acclaimed dance productions, he has also directed Sampurna Ramayana, the mega-production for Delhi Government, annually presented on the occasion of Dussera. The story of Parashurama, the only Brahma-Kshatriya, born in a Brahmin family with Kshatriya traits of fearlessness and valour, covers the important episodes of his life journey right from his receiving the axe (Parashu), bequeathed by Lord Shiva after his arduous penance, undertaking the Kathin Tapasya. Parasurama also appears in Ramayana when Rama breaks Shiva’s bow in Sita’s swayamvara, interestingly the only instance, where two incarnations of Vishnu come face to face as adversaries! The storyline proceeds through impressive dialogue delivery, emotional impact of Abhinaya and dynamic dance sequences. The captivating choreography of Shashidharan Nair is enhanced by the appropriate music, like the use of Chenda, Maddalam and Talam for the valour of Parashurama and shades of classical to folk music for other dance sequences, thoughtfully conceived and composed by Madho Prasad. Sare Jahan Se Achha ~ 2017, the two-day classical dance festival jointly presented by Utsav Educational and Cultural Society and Ranjana Gauhar’s Odissi Dance Academy to celebrate the spirit of India’s independence, at the Stein Auditorium of India Habitat Centre, took a flying start with Jhansi Ki Rani, a group presentation produced, directed and choreographed by the Padmashri Awardee Odissi dancer/choreographer Ranjana Gauhar. Based on the story of Rani Lakshmi Bai described as a spirited, full-blooded woman, who prefered to wear male attire on horseback, a cool-headed and far-sighted leader full of warm concern for her soldiers, Jhansi ki Rani lives on in the immortal poem by Subhadra Kumari Chauhan’s rousing poem of the same title, perhaps the most popular literary piece that celebrates her valour and bravery.This was followed by the lyrical solo Odissi Abhinaya by Ranjana herself on “Dheer sameere…,” the Ashtapadi from Jayadeva’s Geeta-Govinda. Sattriya exponent Anita Sharma, next opened with Krishna Vandana with Chali dance, characterised by graceful movements with the traditional three segments of Sattriya, namely, the Ramadani, Geetor Naach and Mela Naach. This was followed by the Abhinaya piece based on the story of Kubja, the hunchback woman from Mathura, who was a great devotee of Krishna. The emotional intensity of Anita’s Abhinaya as Kubja came to the fore when she lovingly applied the sandal paste to Krishna and when he touched her chin, straightening her body into a beautiful maid. The versatile dancer, choreographer, researcher, author, and Guru Sandhya Purecha presented a Bharatanatyam Varnam next. The Varnam, composed by Sarfoji Maharaja II, of Tanjore in Marathi language, was in raga Pantuvarali set to Tisra Atta and Surfakhta Tala. The Varnam was about a Praudha Nayika, who chides her two younger Mugdha, or adolescent friends, to behave themselves as grown ups if they wanted to charm their beloved Nayak. Sandhya herself as the Praudha Nayika and her two disciples Chitra and Suhani as Mugdha Nayikas were simply convincing and captivated the audience with both their technical virtuosity and emotional appeal. The concluding Kathak by the famous duo Nalini-Kamalini and their disciples gave an altogether different flavour, charming the audience with the authentic feel of the rarely seen Benaras Gharana. Opening with Mahadeva Stuti, an invocation to the God of Dance itself, set to a Dhrupad “Chandramani lalaat Bhola…” in raga Malkauns. This was preceded by the famous Doha “Mor-Mukut kati kaachhani, kar murali, ur maal…”, an ode to Krishna. This was followed by the impressive footwork and technical aspect of Kathak in Teentala, where they presented the traditional repertoire of their dance form, adorned with Kavitta, Chakkardar Tihais, Paran and Gat-Nikas and Gat-bhaav et al. 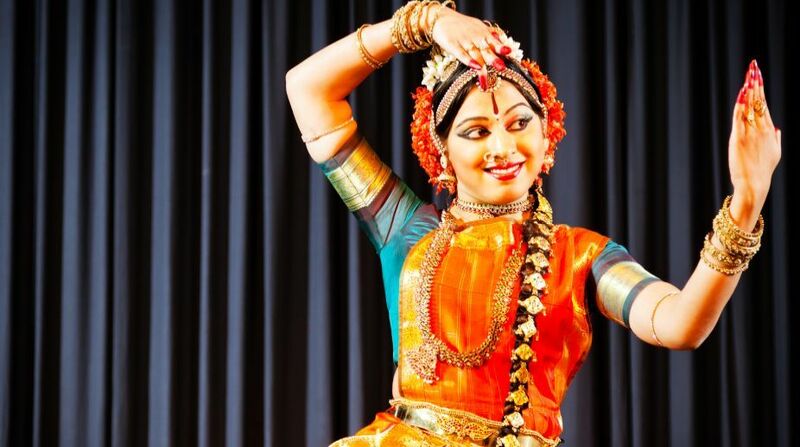 The dance forms presented next evening featured Ileana Citaristi in Odissi, Vyjayanthi Kashi in Kuchipudi, Uma Dogra in Kathak and Saroja Vaidyanathan in Bharatanatyam with their disciples. This year’s Utsav Awards went to Sunil Kothari and Leela Venkataraman.